Service automation has long proved to be a useful driver of efficiency and cost-effectiveness. Nowadays, many hotels use automation technologies, such as self-service check-in kiosks and mobile service requests, to bring down costs and make operations run more smoothly. The most innovative hotels, however, are taking it to a whole new level by injecting robots into customer service roles. While the introduction of robotics into the hospitality industry is still in its early stages, it will come as a shock to very few that Japan is leading the way in this particular niche. Indeed, Japan is dominating the technological development of robots across the world, rapidly welcoming humanoids into everyday life. But while several Japanese hotels are beginning to dabble in the area, one hotel has taken it much further by staffing its entire property with robots. Henn-na Hotel (the name meaning ‘strange’ in Japanese) is the first hotel in the world to have a staff team entirely made up of robots. 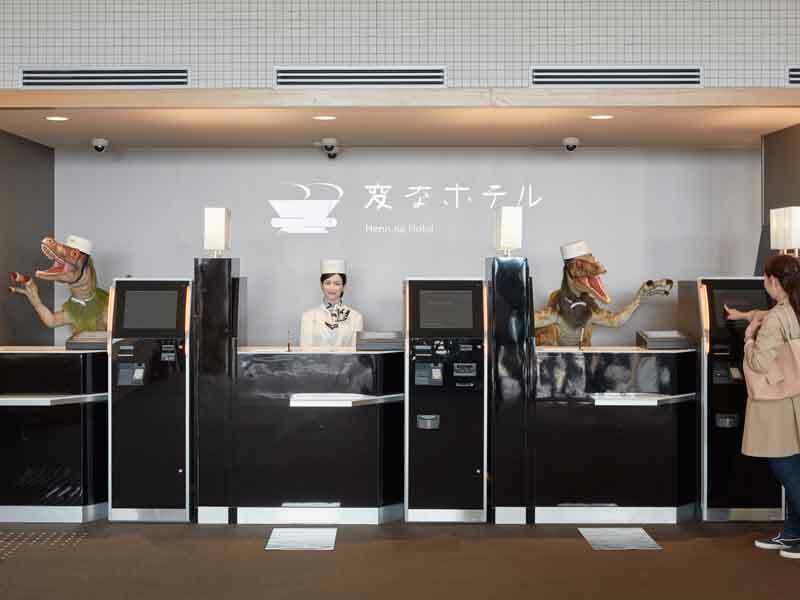 With guests greeted at the front desk by a Japanese-speaking female humanoid or an English-speaking Velociraptor, subtlety doesn’t exactly come into the hotel’s vocabulary. And it doesn’t stop there: the concierge, a classic sci-fi robot interpretation, provides guests with information regarding dining and events. A glass-enclosed robot arm, reflective of industrial robotics, is used as a locker system for customers’ belongings. This ‘robot cloakroom’ retrieves items from guests and safely stores them until they are ready to be returned. Furthermore, a robot porter, activated with a key card, uses autonomous technology to take guests and their luggage to their rooms. Instead of electronic room keys, facial recognition technology is used. Digital images of guests’ faces are registered during check-in, meaning they can then come and go as they please without the hassle of keeping a key on hand. Topping off the whole experience is Tuly, a lamp-sized, tulip-shaped robot that provides further customer services within the rooms themselves. Tuly is capable of providing answers to simple questions, and can turn the lights on and off when requested. 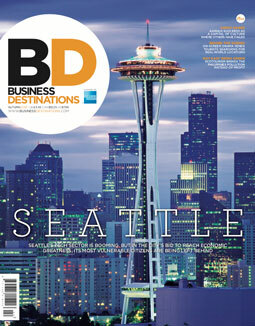 The innovation at Henn-na Hotel has attracted massive amounts of attention from international media and tourists alike. While the fun and quirky nature of the robot-staffed hotel may have generated interest, there is a much greater reason for why it was created: Hideo Sawada, Founder and Chairman of HIS, the travel company responsible for the project, told The Japan Times that the aim of the hotel “is not about being strange, it’s about transforming and evolving”. Having opened its doors to more than 80,000 guests in the past two years, Henn-na Hotel has so far been hugely successful. Sawada and HIS plan to open up 100 more robot hotels in the next five years. It’s not just HIS that has already integrated robots into the industry, or plans to in the near future: the Pengheng Space Capsules Hotel in Shenzhen, China is also largely staffed by robots. Although the technology may not be quite as advanced as that employed at Henn-na Hotel, the blue LED lights and space-themed design, along with the hotel’s own service robots, give it a fun and futuristic feel. The use of robotics varies throughout the hotel, from the reception desk staff to a robot waiter with heart-shaped eyes. The cost of a one-night stay starts at a mere $9, proving how the adoption of robots is not only cost-effective, but can also make companies highly competitive within the wider hospitality industry. Singapore has also recognised the potential of integrating service robots in the industry. AURA at M Social Hotel is Singapore’s first guest-facing robot butler, and delivers items like bottled water, towels, toiletries and packed meals to guestrooms. Its autonomous technology means it can ride elevators, navigate to rooms and announce its arrival by calling the room’s phone. Generally speaking, robots like AURA help with the workloads in the front office, housekeeping and food and beverage departments: they boost productivity by freeing up staff members to focus on other customer-facing services. Travelzoo’s 2016 report on consumer acceptance has provided the much-needed research that could anticipate consumer reactions to robotics in hospitality. As suggested by Ivanov, some countries (such as Germany and France) are not yet accepting of robots in customer-facing roles. However, other countries have welcomed the technological advancement. In the report, China ranked as the most accepting of robot staff in hotels, while two thirds of Japanese travellers said they would prefer a robot hotel receptionist to look like a machine. Overall, the general acceptance of robots in hotels was surprisingly positive; almost three quarters of consumers believe robots could improve customer services. Unlike robotics in other industries, the most fundamental part of achieving success in hospitality will come from developing reliable relationships between consumers and robots. Good quality human-robot interaction will determine how far robotics can be consolidated into everyday hotel operations. It has been predicted that in the marketplace of 2025, technology such as service-providing humanoid robots will be melded into numerous service experiences. According to Collins, for robots to perform well and merge into hospitality, “social interactions will require further development in robotic design and artificial intelligence”. Hotels such as Henn-na Hotel prove that social agents who engage in social interactions do not have to be human, but can in fact be technologically generated. However, the technological advancement in social interaction is still imperative. Once consumers can get the experience of social gratification, trust and some level of empathy from customer service robots, the hospitality industry may just be transformed.